We hope that our Christmas Messages are ones that you share. 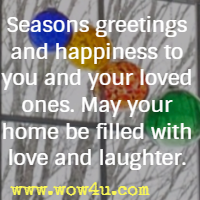 You will find Christmas card messages, ones for fathers, mothers, grandmothers, grandfathers, husband, and for family and friends. You can use them when writing your Xmas cards, letters or emails. 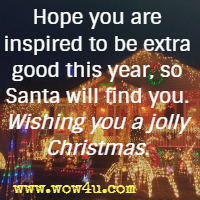 You may also want to read our pages of Christmas Poems and our pages of Christmas Quotes and Christmas Greetings; as poetry and quotations are also wonderful ways to express your thoughts. Our hope for you is that our writing and our words are ones that help you express your feelings during this special season. May God's blessing be with you and yours this Christmas Season. Two thousand years ago, "Joy to the World, the Lord has come!" was said. May those words give you meaning and joy this Christmas season. Christmas is not just for little girls and boys, Christmas is more than all those toys. Christmas is a time to reflect on the season, and remember that Jesus is the one true reason. 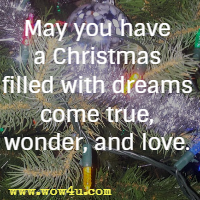 Wishes are sent to you this day in hopes that your Christmas is magnificent in every way. This message brings you a word of cheer to let you know it's that time of year. A time to say I am thinking of you, and hope your Christmas is the best one too! May you have the same wonderment and belief that children have, fill your heart during this holiday season. Wishing you a childlike excitement this season. Christmas can be like a major snowstorm, snow blowing in every direction. Here's hoping that when Christmas day arrives you can relax and see the sunshine coming over the horizon! May your heart be filled with the peace and joy that Christmas represents. May this Holiday season be one where you will be surrounded by those you love, by those that make you feel jolly, and by those who bring a warming touch to the season! There is a magic in the air at Christmas. May the sparkles and shimmering touch your spirit. Christmas would not be the same without friends like you. I just want to say I wish you happiness at Christmas and all year through. Imagine if this season would stay all year, and the love people show at this time of year, would never disappear. Hope you have a great Xmas. With each Xmas card I write, memories of good friends and good times flood my mind. Thank you, my friend, for being a part of my life. It doesn't matter how we say it - Merry Christmas or Happy Holiday or Joyeux Noël - what matters is that we remember why we say it - the birth of Jesus. Christmas Eve is a time of excitement for the children in waiting for Santa to arrive. Our hope for you this Christmas is that once the kids are tucked in their bed you will feel a special feeling that this season brings. As a family, we have so many memories. This year our hope is that your best Christmas memory will be blown away by the great Christmas you will have. With each Nativity scene I see, I am reminded of the miraculous event that occurred many years ago. And the miracles that happen today, may we all have the eyes to see them not only during this season but all year long. Dad, I don't tell you enough how loved you are. You are always there no matter what. Thank you, my Father, for being the one who loves me and cares no matter what the day. So at this time of year let me especially say, I love you and thank you for always being there. When I think of Santa I think of you - jolly, happy, and giving all the year thru. So my hope this Christmas for you my Dad is that it is one that will make you glad. May the gathering of family and the laughter of friends remind you of how much you are cherished and loved not just at Christmas but the whole year through. Dad the pressures and cares of everyday life are with you throughout the year. But this Christmas season I hope you experience the gifts of peace, love, and happiness from those who love you dear. Mom, you make our Christmas so special by all you do. We want you to know how much we love you. Merry Christmas Sis! The memories we share, the peaking and snooping we did makes us laugh today. May we continue to make memories that we can pass to our children. Love you. My dear brother, as they say: "you were first a brother, then a bother, now a friend." May this Christmas bring you all you wish for and more! There is no greater gift than spending time at Christmas with you my dear brother. All the very best of the season is my wish for you. At this time of year, I pray for God's blessings for you my dear brother. May you find a special peace at this joyous time of year. Just want you to know I love you, my Grandma. My longing for you this Christmas is that the light that shone so bright on that first Christmas Eve, will shine on you and bless you. May your special memories of Christmas continue to be made this Christmas. May your day be filled with love and happiness like the love and happiness you bring into our lives. Grandmother, you taught me the true meaning of Christmas - Christ was born, and the colors of Christmas are a reminder of His love for us when he died upon the cross. Red the color of His blood and green the color of the tree. May this Christmas be one that is special to you because you are special to me. A saying that is true, a saying for you: "you put the grand in Grandfather" applies to you. My Gramps you are special, I love you so much. You are my special teddy bear, I will love you forever I swear! You play with me, you love me, you take care of me, and always watch out for me. When I am sad, you make me glad. When I am blue, you tell me, "I love you." Thanks, Grandfather for being that person on my life who I can always rely on, no matter what. Merry Christmas to you, I hope you know you are loved a lot. Gramps, may your Christmas be one that brings happiness and joy, surrounded by your family who loves you more and more each year. A husband you have been, a friend to the end. I thank God for you every day. But on this Christmas day, I pray that God blesses you. You are a great husband and I know I have been blessed because God in heaven sent me the best. You fill my Christmas with love. You make the season bright. I knew I loved you at first sight. Merry Christmas My Husband! There is no one I would rather spend Christmas with. You fill my heart with joy not only on this special day but every day of the year. Merry Christmas Darling! When you see the Christmas tree lights and the tinsel sparkle may it remind you of my love for you. The love we share is the best gift a person could have. A gift that we have not just at Christmas but every day of the year. You are my honey-bunch, you are everything to me, I wouldn't trade a single thing. So merry, merry Christmas, and may this message bring, A love that is for all seasons and all happy things. Thank you for sharing, thank you for caring. May your Christmas bring many returns for all you do.